Pocket-megazoom cameras have been around for a few years now, but you probably haven't seen one as small or as simple as the Canon PowerShot Elph 520 HS ($300 as of April 7, 2012). In a way, it represents a new breed of basic compact camera: Rather than cramming more megapixels into a tiny sensor, the 10-megapixel PowerShot Elph 520 HS keeps the pixel count relatively sane and jacks up the optical zoom to 12X (28mm to 336mm), an impossible-sounding level for a camera of this size. This tiny little camera can fit comfortably in a shirt or pants pocket; at just 0.76 inch deep, it's the size of a deck of playing cards, and it's a pocket megazoom that's even smaller than many of today's 3X-optical-zoom cameras. The trade-offs for the tiny size start with the camera's manual controls for shutter and aperture--there aren't any--but this model does offer Canon's latest auto-exposure functions, scene modes, and in-camera effects. Regrettably, this camera is a disappointing performer, at least if you're used to the generally excellent output of Canon's PowerShot line. Our review unit made everything look a bit soft, and the PowerShot Elph 520 HS will leave many owners wanting bigger buttons, better battery life, and more fine-tunable control. For casual shooters who just want as much optical zoom as possible in a pocket camera, it's still a good option. Getting a razor-sharp shot with this camera may prove to be a challenge, but if you do snap one, it should look great. In PCWorld Labs subjective tests for image and video quality, the PowerShot Elph 520 HS scored very well in most categories, but image sharpness was a major weak spot that brought down its overall score. Although we didn't see a lot of chromatic abberation or fringing in our test shots, everything looked slightly fuzzy. Unfortunately, it's easier to fix exposure and color problems during the editing process than it is to sharpen up a soft image. As a result, our judges gave the PowerShot Elph 520 HS a sharpness score of Poor in our tests, but its ratings for exposure quality, color accuracy, and lack of distortion were among the best we've tested in the world of point-and-shoots over the past year. Held back by the disappointing sharpness scores, its overall imaging score fell at the low end of our Very Good range. Video performance was also a bit of a letdown, given Canon's consistently high scores for video-capture quality. Still, the PowerShot Elph 520 HS netted a video-quality score of Good. Again, fuzziness was an issue, and colors in our test footage looked a bit too vibrant to seem "real," but the camera did an admirable job of brightening up video that we shot in low light. Another issue: This model's battery life falls well short of the 300-plus shots we look for in a point-and-shoot camera. The PowerShot Elph 520 HS is rated at just 190 shots per charge of its tiny, ChapStick-size lithium ion battery, a score that falls in our Fair range. As with many long-zoom cameras, the 12X-optical-zoom (28mm to 336mm) PowerShot Elph 520 HS's major drawback is its narrow maximum aperture of F3.4 at wide angle. This camera doesn't have full manual controls or aperture- and shutter-priority modes, either, although it does provide a long-shutter scene mode that lets you dial in shutter speeds from 1 second to 15 seconds. To the left are sample shots that showcase the camera's field of view at wide-angle and full telephoto. When zooming quickly from wide-angle to full telephoto, the camera's autofocus system searches a tiny bit from midrange to full zoom, but generally locks focus on faraway subjects within a second. The camera's optical stabilization system works well in steadying shots, as long as it's dealing with a relatively normal amount of hand shakiness. You'll need to at least attempt to hold the camera steady; using a flat surface or a tripod, if possible, is always a good idea. The camera can extend beyond its 12X optical zoom range to a simulated 21X digital zoom, although you will see a loss of detail and paintlike pockmarking at larger sizes in shots taken with the digital zoom enabled. The PowerShot Elph 520 HS also has a Program mode that lets you set ISO (100 to 3200), white balance presets, and light-metering presets (evaluative, centered, and spot metering), as well as Canon's full boat of specialized shooting modes. You can preview and apply a few fun filter effects as you're shooting, such as a tilt-shift-simulating Miniature Mode, a Toy Camera filter, and a fish-eye lens effect. To eke the most out of the PowerShot Elph 520 HS's 10-megapixel backside-illuminated CMOS sensor, you can turn to a couple of low-light scene modes available in the camera's menus. Handheld Night Scene mode stacks three shots taken in rapid succession at different exposure settings to create an HDR-like photo that brings out detail in darker scenes. Low-Light mode jacks up the ISO and uses pixel binning to increase light sensitivity while reducing resolution to 2.5 megapixels. Of those two modes, Handheld Night Scene performed much better in my hands-on tests, producing more-accurate white balance and sharper contrast in low-light scenes. That said, both modes' images suffered from noise and a decrease in detail when we viewed the results at larger sizes (you can see sample shots taken in each mode above). Other scene-mode highlights include Canon's Color Accent and Color Swap modes, which let you bring out a single color in an otherwise black-and-white photo or swap instances of colors in a photo, respectively. You can see examples of those modes in action to the left; in Color Accent mode, red is the only color visible, and in Color Swap mode, I switched all the red objects in the frame to yellow. Like other recent Canon cameras, the CMOS-sensored PowerShot Elph 520 HS also has a high-speed still-shooting mode (about 7 shots per second at a reduced 2.5-megapixel resolution) and a superslow-motion movie mode that records 320-by-240 footage at 240 frames per second or 640-by-480 footage at 120 fps. The PowerShot Elph 520 HS also performs well in macro mode, with the ability to capture a clear close-up shot when you position the lens less than an inch away from the subject. All in all, despite the lack of manual exposure controls, the in-camera settings cover a wide array of photo options. There is only one word to describe the PowerShot Elph 520 HS's physical build, and that word is boxy. It's a solid deck of cards, with sharp corners and few protrusions aside from the shutter button/zoom control on the top of the camera. Although the camera doesn't offer a raised handgrip, it is small enough, and light enough, to hold comfortably with an index finger around the edge. The control scheme is a departure from most Canon PowerShots; the Elph 520 HS has controls handled by tiny buttons on the back and top of the camera rather than the usual directional pad or scrollwheel. A 3-inch-diagonal LCD screen and seven small buttons, each of which is about the size of a piece of confetti, dominate the back of the camera. You get a dedicated video-record button; a diamond-shaped arrangement of four buttons that let you navigate menus and supply quick access to exposure compensation, macro mode, flash, and display settings; and two buttons below that let you select a function and access the in-camera menu. 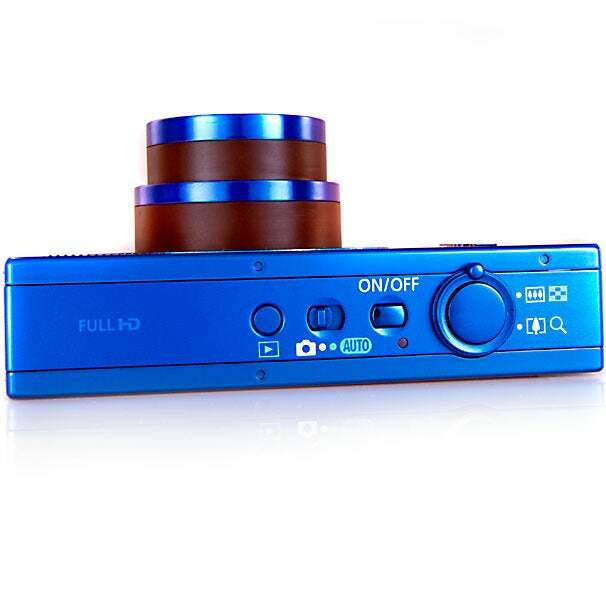 On the top of the camera are the expected shutter button/zoom control, the power button, a toggle switch for selecting between Auto mode and the camera's program and scene modes, and a playback button. 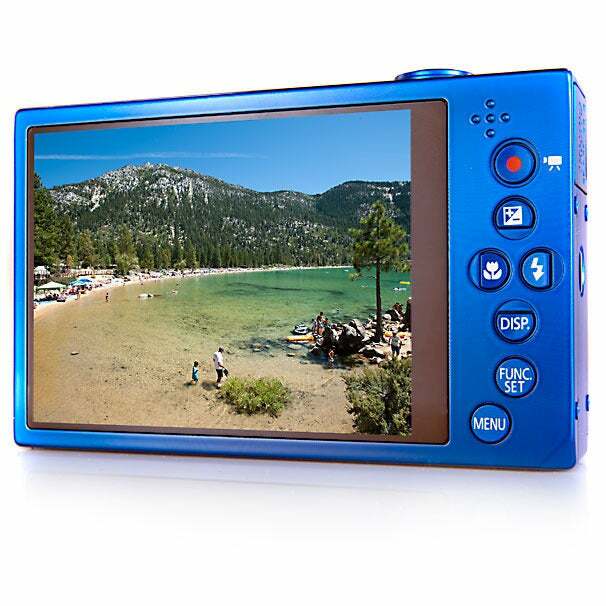 Three doors cover ports on the camera, consisting of one for the battery port and another for the MicroSD card slot on the bottom of the camera, plus a plasticky door on the side of the camera that covers both a Mini HDMI connection and a Mini-USB port. You get a tripod mount on the bottom of the camera as well. If you're eyeing this camera, that MicroSD card is something to think about. It may not be a huge deal for anyone who plans to buy a camera and a storage card in one trip to the store, but anyone who owns a full-size SD/SDHC/SDXC card that they were hoping to use with this camera is out of luck. Many MicroSD cards come with a MicroSD-to-SD-Card converter, which you may need to use to offload photos and video to your computer, although connecting the camera via USB will work for that, too. It's best to think of this camera as a solid, basic point-and-shoot that happens to have a particularly long lens. If you're a fan of Canon's older, easy-to-use PowerShot SD series, the PowerShot Elph 520 HS basically adds a lot of zoom to that line. The major issues are the less-than-sharp images, the disappointing battery life, Canon's space-saving decision to use a MicroSD card for storage, and the lack of manual controls. It's a small camera, too, which offers benefits in terms of sheer portability but also means it has tiny buttons (so it may be a challenge for larger-handed users to operate). Overall, the Canon PowerShot Elph 520 HS disappoints in photo quality and performance, but as a simple, pocketable camera that offers impressive optical reach for its size, it should do the trick for many casual photographers. This story, "Canon PowerShot Elph 520 HS Review: Ultracompact Camera With 12X Optical Zoom" was originally published by PCWorld.